Cultivated potato producing good quality tubers with smooth white skin and white, soft waxy textured flesh. "First Early" variety. Not particularly high yielding, but good disease resistance. Succeeds in most soils but dislikes very wet or heavy clay soils. Prefers a slightly acid rich soil with plenty of organic matter, the tubers can be subject to scab on limy soils or those deficient in humus. Likes a sunny position. 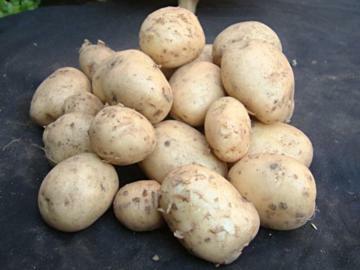 Plant out tubers in mid to late March for harvesting in June or July. Culinary vegetable. Good for boiling as new potatoes. Raised in Scotland about 1968.